Keeping an ATSC (or ATSC Mobile DTV) single-frequency network (SFN) running smoothly not only requires that every single TV transmitter functions properly – the RF performance criteria echo pattern and frequency deviation also have to be strictly complied with. 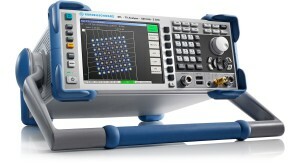 The R&S®ETL TV analyzer enables operators to check these crucial RF parameters at a glance with unmatched precision. The patented implementation achieves an echo delay resolution of one nanosecond, which is nearly a hundred times higher than in conventional approaches. This allows more precise control and adjustments of the several transmitters within the ATSC (or ATSC Mobile DTV) SFN and thus helps to ensure excellent coverage for the receivers.